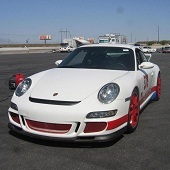 Drivers Education (DE), also known as High Performance Driver Education (HPDE) events, are defined as continuous lapping events on an approved motorsports course. Passing is cooperative (i.e. both the passing vehicle and the vehicle being overtaken communicate using clearly established hand signals). Laps are untimed as these events are intended to be instructional only... no competition. This is not racing! The Las Vegas Region is fortunate to have an array of nationally trained instructors to assist students and accomplished drivers alike to improve their skills. The best way to register is online at Motorsportreg.com where you will also find event specific information. You may register at the track by cash or check if space is available. Be aware that the event may be sold out so it is always better to register online. Driving on a racetrack at speed is an activity that involves risk to both the participants and the participant's property. For this reason, it is CRITICAL that all vehicles be inspected to reduce the risk of mechanical failure. Track conditions are far more demanding than city or highway driving so if a vehicle has any mechanical defects, there is a high probability of failure on the track. Therefore, it is the driver's responsibility to insure his or her vehicle is thoroughly inspected for any possible safety problems prior to the event. 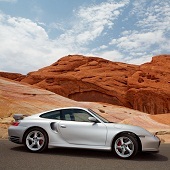 Las Vegas Region recommends both a personal inspection by the driver (self tech) and an inspection by a qualified Porsche technical inspection station. We provide a Technical Inspection Form to aid the driver with the inspection process. Technical Inspection Forms must be completed and signed prior to registration at the track. It is advisable to keep a copy of your registration form, and one copy of your completed form should also be retained by your inspection facility. Bring an Inspection Form with you to your appointment. Both you and your mechanic should sign it. 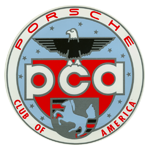 Please make an appointment with one of the above service facilities or with another certified Porsche mechanic to have your Porsche inspected no more than 14 days prior to the event. Bring your completed tech form with you to the track in order to avoid holding up the early morning tech line at the track the day of the event. New drivers who wish to enroll in our Driver Education program are required to attend a mandatory Introductory Driving School. This outstanding program of instruction is usually held on the first morning of a two-day driver education week-end. 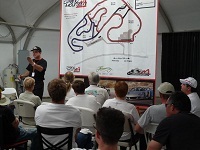 The Introductory Course includes a few hours of familiarization with proper track etiquette, driving the proper line around the race course, learning the track's official flags (or lights), hand signals, passing zones, regulations, a discussion of safety issues, tire pressures, driving position, pit and paddock rules, track maps, and more. Once the classroom session is over, hands-on driving instruction begins that includes driving exercises on our skid pad. Exercises include braking, high-speed lane changes, weight transfer exercises, acceleration and much more. 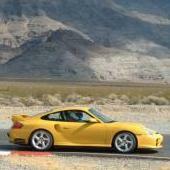 These car control exercises help the driver to develop the skills that will be needed on the racetrack. All driver education participants must wear an approved motorsports helmet. Approved ratings include Snell SA, SAH, K, or M; 2005 or 2010. Motorcycle helmets are not permitted as they are not fireproof. Comfortable long sleeved clothing, long pants and socks should be worn, all made of natural fibers (cotton, wool, etc.) as synthetic fibers burn and melt in a fire. Open toe shoes are not permitted. Wear lightweight, lace-up shoes. Eyewear and SFI or FIA rated racing gloves are recommended. Las Vegas Region operates these events under PCA Zone8 Rules. Please review the rules prior to attending the event. Pay particular attention to the Driver Education sections. Arrival: Arrive at the track early. Check the schedule for times when the event opens. There is always a lot to do to get ready for your first run session (check tire pressures; clean windshield; check fuel; remove items from the vehicle; final safety check of the car; etc.) so it is wise to arrive early. Waiver: There are risks involved at track events. Therefore a waiver form must be signed to protect the club and track against liability claims at each event. 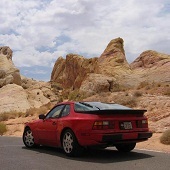 At times there may be both a track waiver and club waiver. These must be signed in order to be on site at the facility. Tech Inspection: Take your completed, signed tech form, your vehicle, your safety equipment and yourself to the Tech Inspection Station for sign off. Check the schedule for times when tech opens. Your vehicle and safety equipment must be signed off before entering the track. Driver's Meeting: Before track sessions begin, a mandatory drivers meeting is held for all participants. Please be on time. Track procedures for the event, passing rules, flags, news and important event information is diseminated during these meetings. The Driver Education Introductory Driving School will start immediately after. 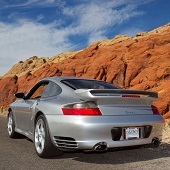 Often times non-Porsche participants are welcome for these events, and no special safety equipment is required for these events other than regulation helmets and other safety equipment mentioned above. 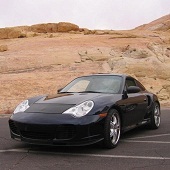 Convertibles must have roll bars or other rollover protection. If you feel you feel you have had equivalent experience with another reputable car club or high performance driving school, please contact the Event Chairman or Driver's Ed Chairman to discuss your situation. Once you have participated in our Introductory Driver Education School or gone on a check ride with an instructor , you will immediately be able to progress to that weekend's Drivers Ed track event. Please sign up for the Drivers Ed event in advance to ensure your place in the Introductory School and to ensure that we will have enough instructors for everyone.